Space saving design of the double sided grid bike rack allows for dual sided access with models capable of providing parking for up to 8, 9 & 10 bicycles. Tire slots are specifically spaced to accommodate normal, narrow and wide tires. These units are sturdy but also light weight making them highly portable—allowing quick and easy placement where it's need the most. Created from commercial grade steel, the welded grid panels and precision bent frames exhibit a strength that is optimal for high volume use. 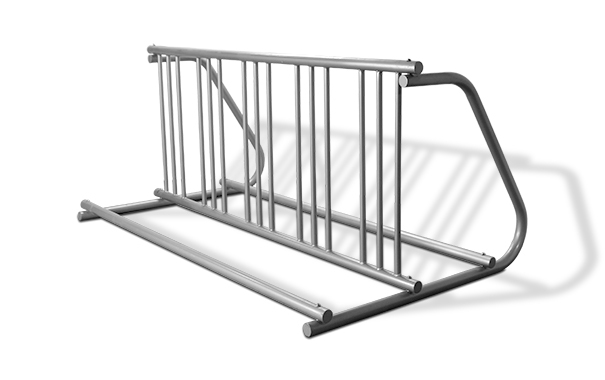 These grid bike racks are sealed with a superior corrosion resistant powder-coating finish that is ready to stand up to every day wear and tear. The clean design, solid construction and superior finish of these imported units generate positive impact on a facility's streetscape aesthetics, while providing the perfect bike parking solution for those with fixed space constraints.